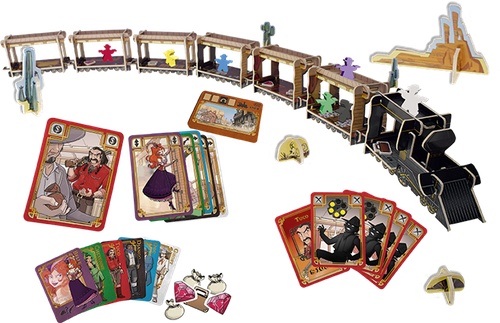 Colt Express is a game for 2-6 players aged 10 years and above where you each play as a bandit trying to rob a train in the Old West. First, you have to plan your moves alongside the other bandits (the Schemin’ phase) and then play them out (the Stealin’ phase) to see if your plans worked and you get the loot. The first thing to mention is that Colt Express uses a model train with various carriages and that these need to be built the very first time you play. If you’re planning on playing this as a family game night, then it would be worth building the trains and carriages beforehand as this took about half an hour. 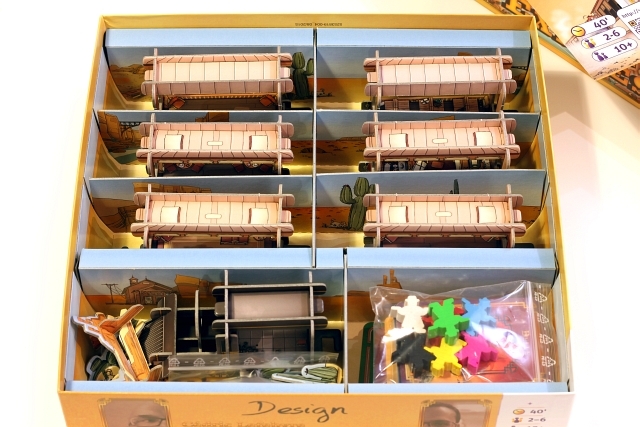 Thankfully the box is cleverly designed so that the train can stay built up when it is packed away. To set up the game you create the train using the engine and one carriage per player. So a 3-player game would have an engine and 3 carriages. Each carriage of the train has different numbers of gems and loot printed on it and you place these pieces inside the carriage. Phase 1: Schemin’: Each player plays 2-5 action cards on a common pile, with the cards face up or face down depending on the type of the round. Instead of playing a card, a player can draw three cards from their deck. 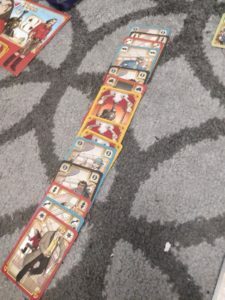 Phase 2: Stealin’: The action cards are carried out in the order they were played, with a player’s best-laid plans possibly not panning out due to mistakes and oversights! If it sounds a little confusing then don’t worry! 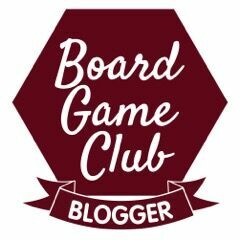 We thought the same too but the instructions are very well written with lots of examples and it’s actually not as complicated as it sounds – it’s one of those games that make much more sense once you actually play it. Players take it, in turn, to play one of their cards but you don’t move any of the pieces just yet. In some rounds, there are tunnels where you play your card facedown and the other players don’t know what you’re Schemin’. Once the cards for that round have been played then you have to carry out the actions for the Stealin’ phase of the game. Working through the cards you have played, you then have to carry out each action – but if you haven’t paid attention to the other player’s moves then you could be shooting into thin air or trying to steal some gems that have already been taken. If you have paid attention, or are just plain lucky, then you’ll successfully collect some loot and/or shoot one of your opponents. Shooting an opponent doesn’t directly harm another bandit but it does mean that when they pick up their next cards for the next round then there is a chance they will pick up a bullet card which is useless for them but reduces the number of action cards available to them. When you first play through the game following the instructions, you are taught the basics of the game but then, you learn that there is more to the game. Each player has a special skill such as an extra card in their hand at the start of a round, or the player can shoot upwards etc. So when you pick your player it is worth thinking about how their special skill can help you or you can pick your character at random for more of a challenge. There are also a number of different ‘end of round’ actions such as the passengers rebelling or the train stopping suddenly forcing the bandits to move forward a carriage. The winner is whoever has the most loot at the end of the game – be it coins, gems or the special briefcase. The bandit who has shot the most people also gets a bonus $1000. Because all the loot is kept secret from the other players throughout the game, it’s impossible to tell how well you’re doing until you total up at the end of the final round. There is a lot of variation available in Colt Express which means you can play it multiple times in different ways. 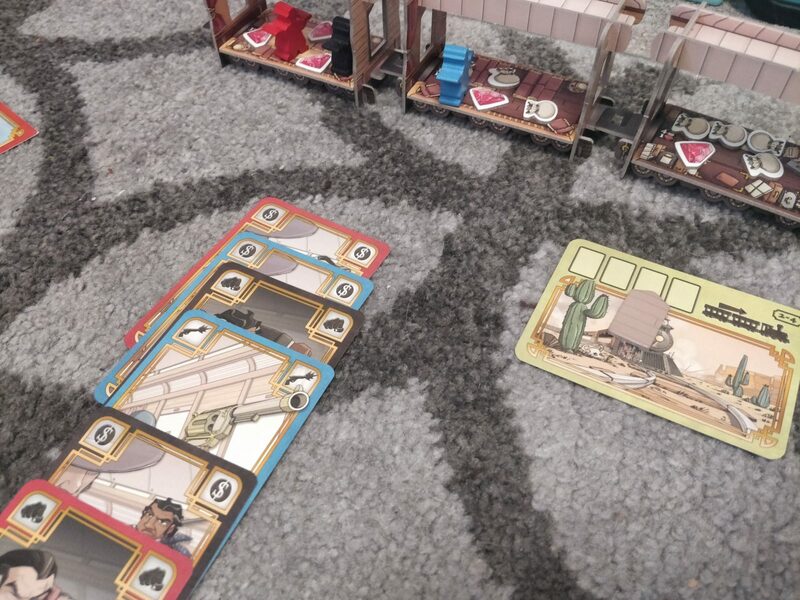 Each carriage has different values of coins and gems so depending on the order the carriages are set up and the loot is placed, the game could change. The bandit’s different skills give another variation to the play and you can tell it’s been designed for longevity. There are even some expansion packs available separately that bring in new characters and play dynamics. 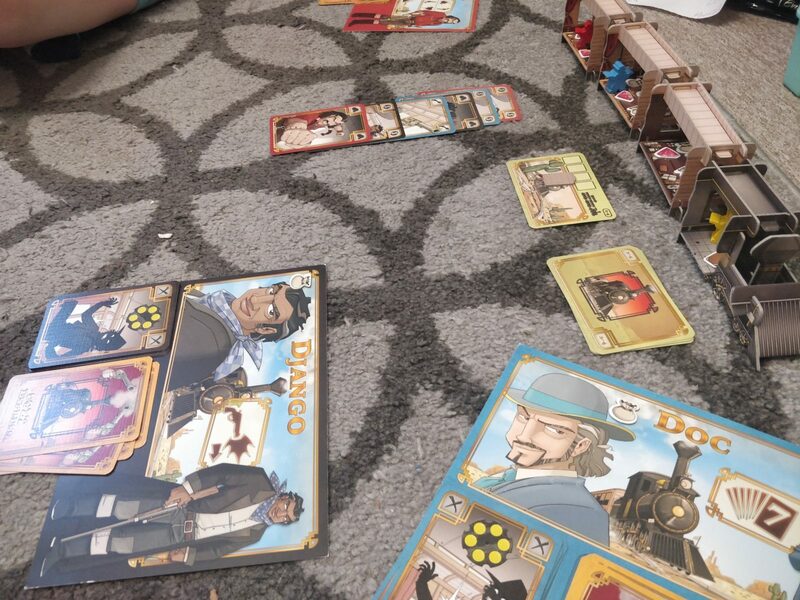 Overall we all really enjoyed playing Colt Express and have had many games since starting the review – it is a very different game each time you play and it’s a good balance of skill and luck. The artwork in the game is nicely done and the packaging is well thought out making for easy storage and set up. It comes highly recommended from us and we’re really pleased we got to review this game. 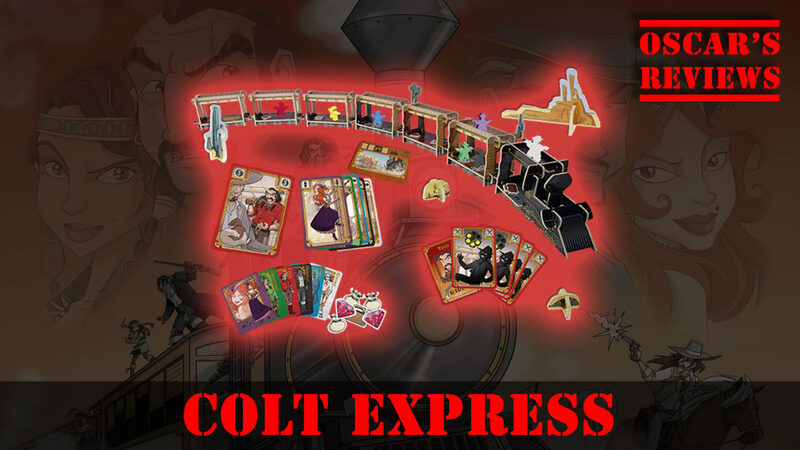 Colt Express is available for around £25-£30 online or from your local games retailer. 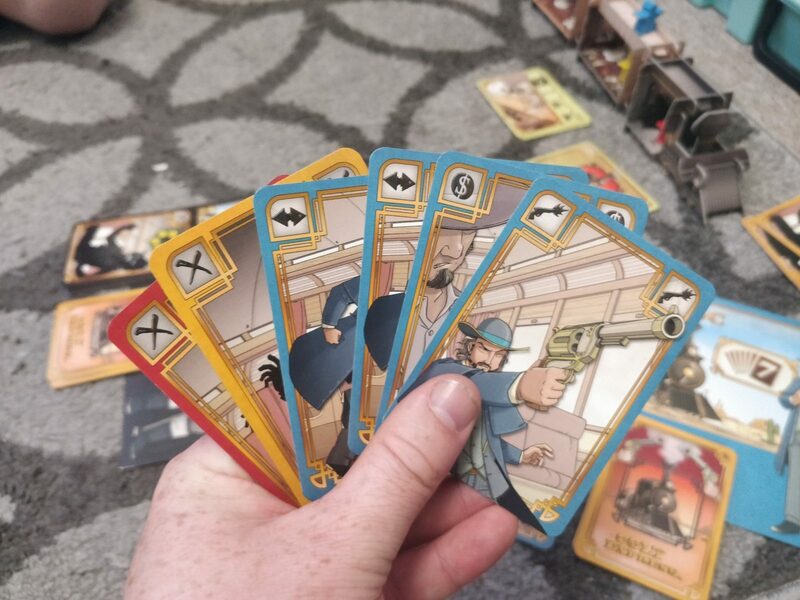 Disclaimer: We were sent Colt Express free of charge for the purpose of this review. All thoughts and opinions are our own.